John Roskelley, water advocate, legendary mountaineer, and author, has a long history of public service. He served on the Washington State Salmon Recovery Funding Board, the Growth Management Hearings Board, and as Spokane County Commissioner. John’s latest book is Paddling the Columbia: A guide to all 1,200 miles of our scenic and historical river. John is especially interested in removing dams, and in restoring health to the Columbia River and its tributaries. 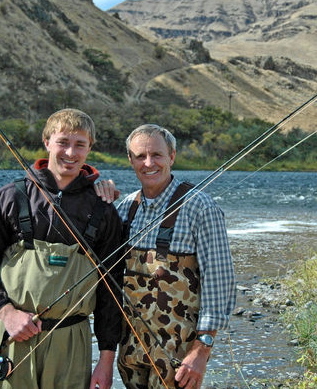 In this photo he is fishing with son Jess.